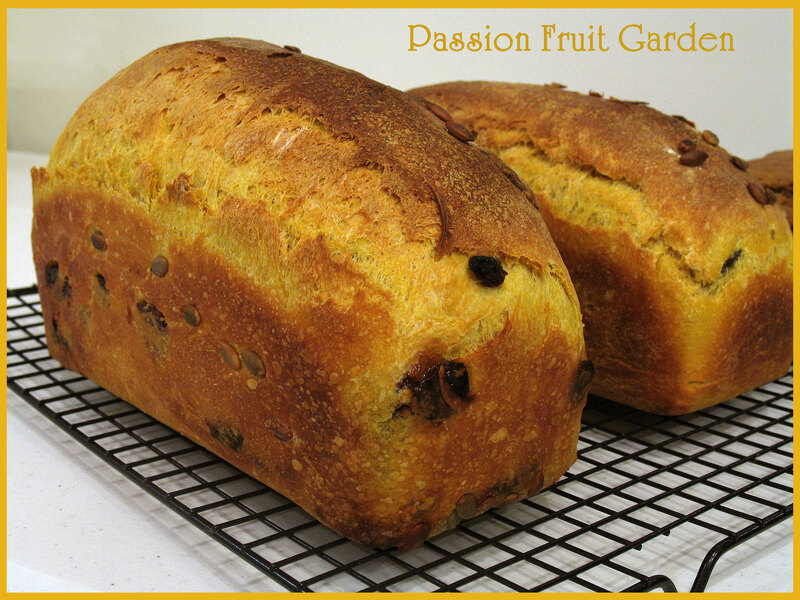 I showcased this loaf in my latest IMK post. As I mentioned in that post, I always make the same recipe (this one) but, the other day, decided to make an effort and try something new. And with all those pumpkins lying around, a pumpkin loaf seemed logical. I must say, I was pretty happy with the loaf when I took it out of the oven but, at the time of writing my IMK post, I hadn’t cut the bread and tasted it. The loaf was well risen and a delightful colour. It verged on warranting the description, ‘beautiful’. The bread did not disappoint when I had some for breakfast the next day. The crumb is tender and the crust is soft, much like a sandwich loaf. Despite the colour, there is no discernible pumpkin taste. I most certainly will be repeating this one. This recipe is from Discovering Sourdough by Teresa Greenway. In the late afternoon, around 16:00 – 17:00 hours, prepare the pre-ferment. Cover lightly and allow the mixture to ferment at room temperature until around 21:00 – 22:00 hours. Put the pre-ferment in the fridge. Take the pre-ferment out of the fridge and allow it to get to room temperature. Put the pumpkin and milk into a blender and blend until smooth. Combine all the ingredients (except the salt) in the bowl of your mixer. Using a low setting, mix the ingredients until just incorporated. Cover the bowl and let stand for 20 minutes. Mix the dough on low speed for 4 minutes. Oil a large plastic container, place the dough in it and cover. Three times, at hourly intervals, fold the dough. This is a bit tricky as the dough is very sticky but do your best. When folding, keep the dough in the container and don’t add flour. After 4 hours, divide the dough in 2 and shape the loaves. Try not to deflate the dough too much at this stage. If you are making any additions**, now is the time. At this stage, and if desired, sprinkle pepitas on the loaves. I decided to make 2 sandwich loaves, so I made 2 batards and then placed them, right side up, in my prepared bread tins. My tins are about 24cm long and 10.5cm wide at the top. If you are making free-form loaves, place the loaves, upside down, in baskets lined with cloth and generously sprinkled with flour or in bannetons. Allow the loaves to prove for 1 -2 hours. I left mine for about 2 hours. Bake in the preheated oven for 20 minutes. After 20 minutes turn the oven down to 200°C and bake for another 20 minutes. Take the loaves out of the oven and release them from their tins. Cool on a cake rack. 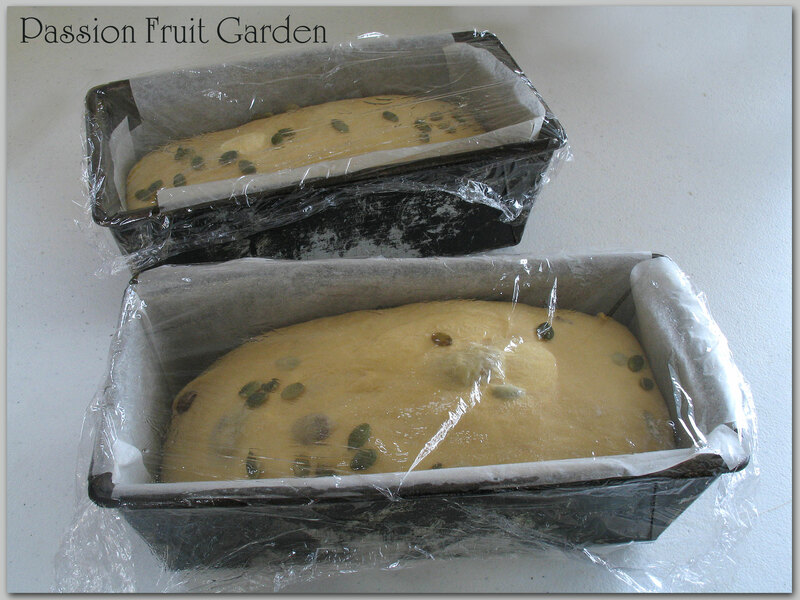 If you are making free form loaves, check out this post for baking instructions. sprinkling cinnamon and raisins on the dough when shaping the loaves. I decided to add 100g of raisins (which I’d soaked in boiling water for a couple of hours) and a few pepitas. Next time, I will follow the instructions a little more closely because the raisins would be better in a sweeter loaf and the cinnamon would add a nice touch. Another alternative, if you want to keep the loaf savoury, is to keep the honey as is and add pepitas, sunflower seeds, pecans or walnuts when shaping the dough. Each would make a lovely addition. 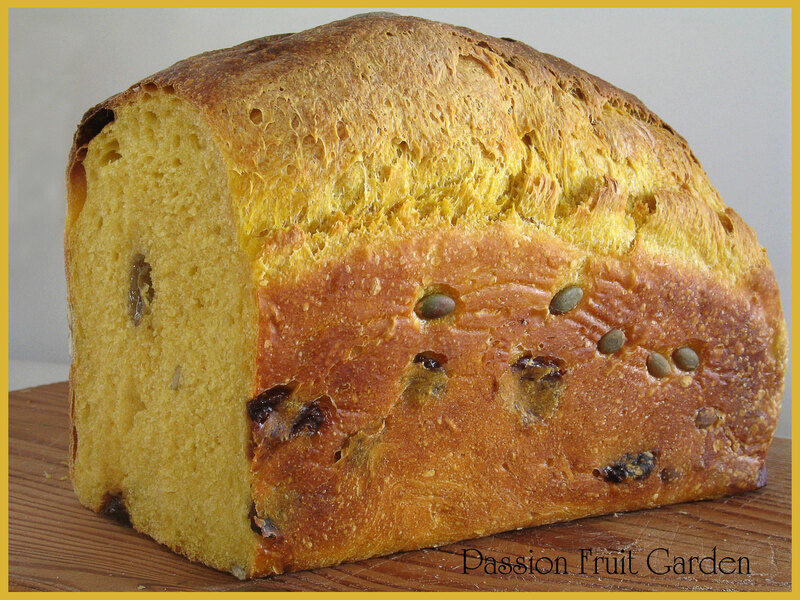 This entry was posted in Bread, Eating your bounty, Pumpkins, Sourdough and tagged Sweet pumpkin sourdough by Glenda. Bookmark the permalink. That’s a beauty of a loaf you made. I really like the idea of the pumpkin flavor in there. Diane, you can barely taste the pumpkin. I think it adds colour and texture more than anything. Also, total mindreader! My sourdough starter is coming alive as we speak! A day or two until I make sourdough everything!!! Fantastic Roxanne. I hope you make lots and lots of beautiful bread. Thanks so much, and thanks for stopping by and commenting. Hi Joanna, You can always knead dough by hand. I just don’t like to. Hi Ella, we will get you baking bread yet. Love the part of the recipe that says “and if you are in the states, canned pumpkin.” Yes, you’re so right – we won’t have fresh pumpkin here for another 3 months. But this recipe is a keeper. I’ll look forward to trying this in autumn. Thanks for sharing. Hi Susan. Thanks for stopping by and commenting. It’s funny, we don’t have canned pumpkin here. Hi Jan. Let me know if you decide to make it. I would love to see a photo. Thank you! I’m saving this for when I get back from overseas. The colour is brilliant – can’t wait to try it. Yeah! Thanks for the recipe. Am going to make this NOW! Still have a carton of pumpkin purée in the freezer from last autumn. Great, tell us what you think. Would love to see a photo.